The Royal Gorge Region is famous for its beauty. Take home your own souvenir by capturing some awesome photos. The following are suggestions for finding the best photo opportunities. 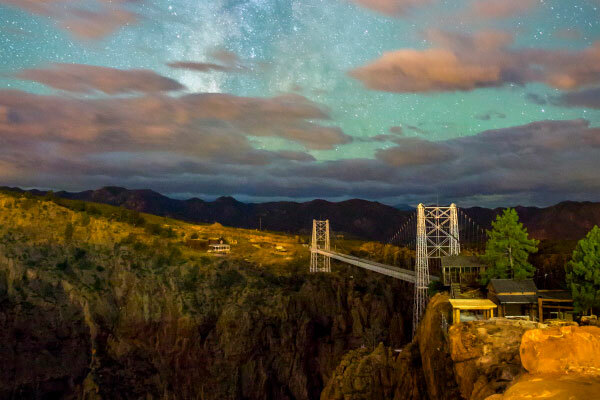 The Royal Gorge in Cañon City offers some of Colorado’s most dramatic views and colors. With its deep walls and Sangre de Cristo Mountain Range-backdrop, the scale and grandeur of the canyon are arguably unparalleled. The Royal Gorge Rim Trail is the ideal place to start your Royal Gorge adventure. It’s an easy 3.17-mile loop trail with only 115 feet in elevation gain. At about 1.9 miles, a spur follows the Royal Gorge Rim to an overlook that provides excellent views of the canyon and river below. With its mild climate and tillable soil, the Royal Gorge Region became a rich agricultural hub starting as far back as the 1860s. With many of Colorado’s earliest orchards planted in Cañon City and Florence, the region became famous for its fruit harvests. Visit Colon Orchards or Jenkins Farms Apple Valley Orchards for a chance to catch springtime blossoms or rich fall colors. Oil Well Flats is a recreational trail system located 6.5 miles north of Cañon City. At the top of the Island in the Sky trail, there’s an expansive view of the Arkansas River Valley, which includes the Royal Gorge, the Arkansas River and the Sangre de Cristo Mountains. A photograph from here will show anyone the varied and dramatic landscape offered by the Royal Gorge Region. Deep within the trail system, other scenic features include a 200-foot cliff of pitted slickrock, a shaded patch of woods and an old burn area that’s been transformed into a rolling prairie. With 600 acres of piñon, sage and red-rock formations to explore, there are dozens of opportunities for a gorgeous photograph at Red Canyon Park, located just north of Cañon City. Red Canyon Park has earned a reputation for inspiring views and gorgeous vistas comparable to Colorado Springs’ Garden of the Gods. The red rocks in this park were carved and sculpted by weather and erosion into a narrow canyon and monoliths with names like Pioneer, Window Rock, the Sphinx and Hoot Owl. Just imagine what the area’s towering red rocks look like as they reflect the setting sun. A hike straight down into Temple Canyon takes you to a floor cut by Grape Creek. In the spring and summer, green cottonwoods and wildflowers line the canyon’s floors. For a unique shot, follow the trail across the creek to a gorgeous, natural amphitheater known as The Temple.